In today's marketplace many products are made overseas. Products from other countries may often lack proper certification for use in Canada and evolving regulations are constantly changing. 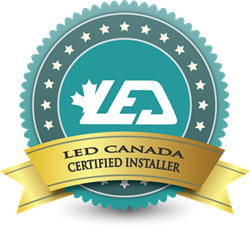 For this reason LED Canada has created its new Certified LED Installer program. To provide resources and help educate installers on the selection and instillation of LED solutions. As LED Canada is becoming Canada’s largest manufacture and national wholesaler of LED solutions we see it as an important part of our role that we help provide the professional resources and knowledge assets to help public, private and commercial customers make the right choices for their LED needs” said President David Schincariol.